Fresh Peach Sweet Iced Tea - Sweet southern iced tea enhanced with a puree of fresh peaches and freshly squeezed lemon juice. It's gettin' to be southern peach time and we've got the early Georgia peaches already showing up in our markets down here in south Mississippi. The first batch I picked up were nice and ripe and supremely juicy, so I thought it'd be a good time to use some for peach tea. I love a good iced tea and for a change, all manner of fruited iced teas, with peach being right there at the top of the list, though I've had some that were not all that tasty and kind of uninspiring and blah. The secret for me that many of them leave out - besides using only fresh peaches, rather than a commercial peach nectar - is also including some freshly squeezed lemon juice. I think that fresh lemon juice just makes the flavor of the peaches pop and Meyer lemons, which are much sweeter than their more acidic cousins, are an excellent lemon to use for drinks if you can get your hands on some. I happened to have some in the fridge, so I used two of them, but good ole grocery store acidic lemons are perfectly fine to use too of course. Just be sure to test this the first time with just one of those, before adding in the juice of a second lemon. You may only want one acidic lemon, again depending on the sweetness of your peaches. Summer peaches tend to be sweeter than these early ones. I also love using simple syrup in summer beverages, so I pretty much make up a batch and keep it stored in a mason jar in my fridge to have on hand anytime the urge strikes say, for a homemade sno-cone, or a cherry limeade, or maybe one of those iced tea cocktails. Of course, if you need to use artificial sweeteners, there's not a single thing wrong with making that substitution, and, if you aren't up to making a simple syrup, regular granulated sugar is just fine. By the way, if you love peaches but hate the peeling part of them, let me tell you about your new best friend... in case you haven't already met. A soft skin peeler. Couple of swipes and easy peachy! Okay. I know that was corny, but seriously, this gadget makes such an easy job of peeling peaches, it's fast and there's no having to fool around with that whole boiling and shocking thing. It's a perfect gadget for tomatoes too. Admittedly the peeler doesn't get a huge workout in the winter months, but, with the early fruits and veggies we're getting in abundance, I've already used it numerous times this spring. Not only does it save time, but it cuts away such a tiny and thin strip of skin that you reserve more of the fruit, so there's much less waste. It's become one of my favorite gadgets! I purchased mine through Amazon last year using my Prime Membership free shipping, while I was ordering some other kitchen stuff. You can purchase through my store here, where I share all of my favorite gadgets, cooking tools and cookbooks, or look for it at your local home goods store next time you're out and about. If you love soft skin fruits like peaches and tomatoes, you will love having this gadget this summer. Early peaches are generally speaking on the smaller side, so instead of giving you peaches in numbers, I've written them in by the pound, so be sure to use that scale at your market. Remember those? I use them, but I rarely see anybody else using them. Yesterday this lady was piling a ton of these huge first of the season Creole tomatoes in a bag that I wondered if she realized they were still priced a little high at $1.69 a pound! She never even looked at the scale. I also have a counter scale at home I purchased during one of my past lives of dieting and I actually do still use it a lot. Another handy gadget. Hey, if I had one of those big dream walk-in pantries, I'd probably have one just like this in there to be honest! So peel and pit those peaches and put them into the bowl of your food processor or blender. I'm using my Ninja that Santa brought me last year and which, with little exception, has pretty much as taken the place of my clunky food processor ever since. This next step is optional - if you don't mind a lot of pulp in your drinks. Personally, I like to push it through a mesh strainer to get most of the puree, but leave behind the larger pieces of pulp. I like a little pulp with some drinks, but not too much. It's a texture thing for me. From there it's just piling it all into a half gallon pitcher and enjoying it. Strawberries are still in too of course, though we're back into the California harvest here mostly, but Mississippi blueberries are just beginning to show up now, so I've suggested those as a garnish to the peach tea... even though I didn't take the time to do it for myself. This was just one of those 'get on with it I don't feel like styling' recipes that I was lucky enough to stop long enough to even take a picture before I drank it all. Sometimes even those of us who write about food just want to eat, or in this case drink. If you're serving this to guests, for a prettier presentation, just throw a cup of either sliced strawberries, chopped peaches or fresh blueberries, or any combination of that into the pitcher. Skewer some on a cocktail pick for each glass, which is exactly what I would have done here had I not been feeling lazy. Let's just blame spring fever, shall we? Maybe next batch! Here's how to make it. For more of my favorite iced tea recipes, visit my Pinterest page! Steep tea bags in boiling water for 5 minutes; set aside to chill. Meanwhile puree the peaches and push pulp through a strainer. Add the strained puree to a 1/2 gallon pitcher, stir in the simple syrup and lemon juice, top with ice and pour tea over the top; stir. Cover and chill in refrigerator until needed, stirring in fruit just before serving. Cook's Notes: I used Luzianne tea and Meyer lemons, which are sweeter. If you're using a regular lemon, you may want to add only one and taste the tea before adding a second lemon. Can substitute 3 family sized bags for the individual tea bags and granulated sugar for the simple syrup if you like. Depending on the sweetness of the peaches you're using you may want less sugar or simple syrup. Oh Anne, I've had those glasses since the 70s! They are Noritake crystal - that's the iced tea goblet - in what they called the Perspective pattern in amber. I picked those to go with the Mikasa Garden Club dinnerware I had back then - with yellow and orange flowers, green leaves & a touch of blue. You know... all those popular colors back then!! I still have a few pieces left of both - and still use it everyday. Mmmm! I love peach season! I was so excited to see this recipe!! I LOVE peach tea, but have never been able to find a recipe that I enjoyed. Once again, THANK YOU!! You're welcome Kimberlee! Please do let me know if you try it and what you think. Enjoy! YUM, LOVE this tea.....totally SOUTHERN and delicious! It is so refrshing. Thanks for another wonderful recipe! You're very welcome Becky & thanks for the comment! Not only do I love this tea, but the plethora of amazing recipes, information, links, book recommendations etc, etc. I could spend the whole day pouring over your site, and still not absorb all that you have to offer !! Thank you for all your hard work in making an absolutely commendable site for all to share and enjoy ! I come from Glasgow, Scotland, now living in Maryland, USA, and most certainly feel closer to Southern cooking than any other region I have discovered. I am now considering starting my own blog and your site has given me the inspiration I need to push forward...lots of recipes passed down from generations of amazing Scottish women, including WWII recipes from my mother, God Rest her Soul. I'll be back, you can count on it ! Thank you - I'm thrilled to hear that you are enjoying the site & I for one would LOVE to see that kind of a food blog so please write me and let me know if you decide to start recording those recipes!! I surely will Mary ! I have not, but will check it out - thanks!! Mmmm, Mary, I just made this tea and it was divine! I started off with white peaches because they were sweeter, but they weren't quite peachy enough so I added a yellow one for the third peach. Thanks so much for sharing! You're so welcome & thanks so much for letting me know you enjoyed the recipe!! 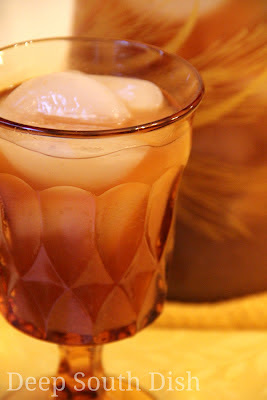 Mary, I love peach ice tea and now that the days have warmed up this would be perfect for sitting in the shade of an oak tree next to my garden while sipping away! Thank you so much Dorothy - that is sweet!! Yeah, I found I didn't have the time to dedicate to it to be fair so I did go award free, but I do absolutely appreciate your thoughfulness! It really is Jessica, thanks! You're welcome! I'm so glad to hear you enjoyed it - it's a little different isn't it? Now I'm gonna have insist that you try this fruited tea recipe next! Oh my gosh is that stuff good! I buy Red Diamond gallon sweeta tea and I/2 Gal sweet peach tea and blend the two together in a empty gallon jug for sweet peach tea quick and easy for this old lady!! !